Congolese star, Koffi Olomide was spotted today, July 22, 2016 physically abusing one of his female dancers. 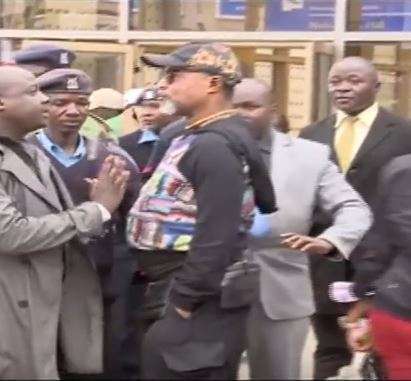 Koffi Olomide was caught on camera assaulting one of his dancers after landing in Nairobi, Kenya. The singer and producer can be seen at Nairobi's airport surrounded by officers who try to hold him off from beating her. In the short video uploaded to YouTube, the rhumba singer is seen approaching the group of dancers before kicking one of the ladies in the belly right before police officers. According to Linda Ikeji's blog, the victim is said to have been arguing with Koffi’s wife, who also accompanied him to Nairobi. The 60-year-old Congolese soukous singer and dancer, accompanied by his wife and a group of dancers, landed at the Jomo Kenyatta Airport to a rousing reception by a group of Kenyan fans waiting to receive him.